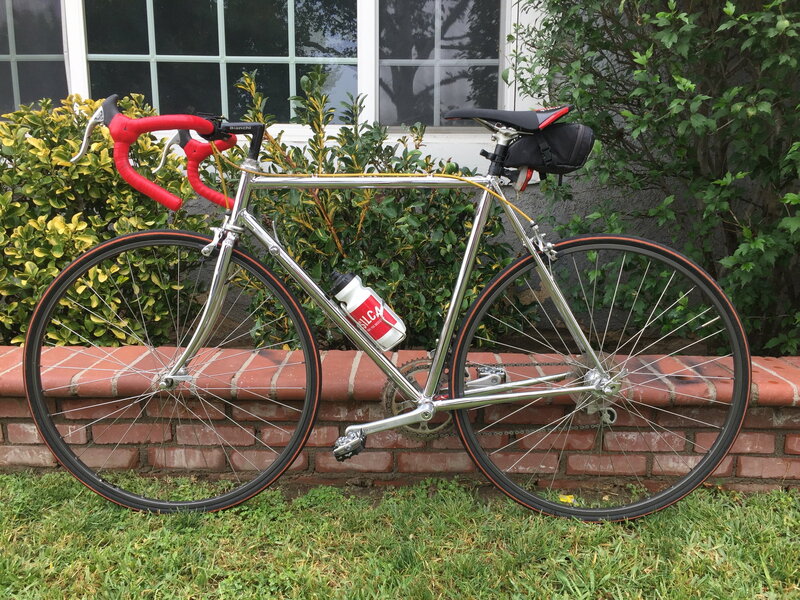 My old Dawes Galaxy; the paint is peeling in spots and it's chrome underneath - all over the bike! They must've chromed the whole frame! Wondering if you know if the factory treated the chrome tubes any way before they painted it, or did they just spray over the chrome? Please enlighten me, thanks. that's pretty common. I don't think there is any special treatment before painting chrome. Note that they wouldn't have polished where they were going to paint, so the chrome isn't as smooth. Not sure if that really helps the paint stick any better though. I don't know how they do it, but they do paint over polished chrome. this was a painted frame before previous owner stripped the paint. Bikes: Why yes, I do! Thank you for asking! Paint usually does not stick well to chromed parts (even unpolished). 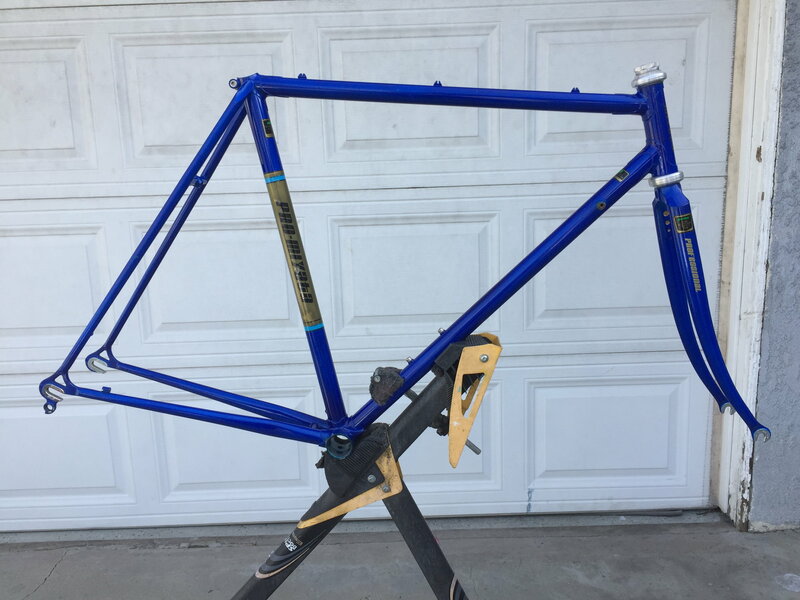 While I was getting an old Schwinn LeTour III frame powdercoated I decided to do the fork myself. 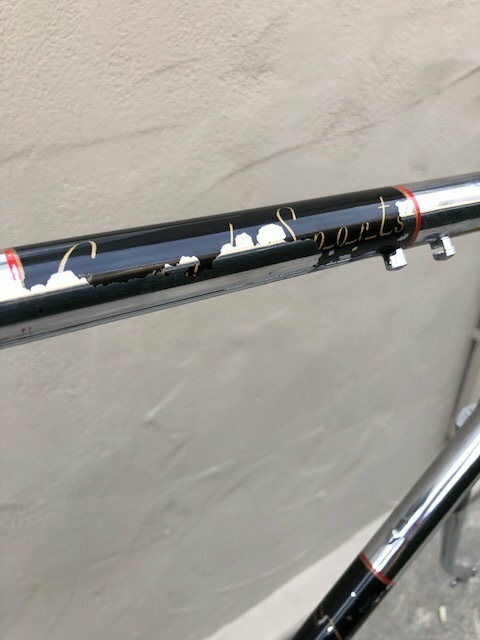 I applied some stripper to the fork (California-approved stuff, so it wasn't as strong as I would have liked, which turned out to be a blessing) and it easily took off the paint to reveal a fork chromed all the way up to the steerer tube. No damage to the chrome from the stripper. Overall it was a nice surprise and looks great on the re-assembled bicycle. it would be interesting to know if that was cromovelato Cromovelato ~ how is it done? Has anyone ever "chrome" coated a bike using the process they use for mirrors? I saw an episode of "West Coast Customs", a car show, wherein they "chrome plated" a car using a spray-on process. The coating is actually pure silver (not chrome) and there is a clear overcoat so it does not corrode. It is a commercial process but does not rely on plating chromium. IIRC, it was a conversion coating - they spray on a silver compound and immediately convert it to pure silver using a second compound coming from a second spray head. I know, it sounds crazy but it worked, is commercialized (so it is credible). Any ever heard of this or used it? If the chrome is mirror smooth, paint won't stick to it well. This one is fully chromed under the original paint. Does this fork look bent AGAIN?